It's well known that Paul is firmly lodged in the Guinness Book of Records as the most successful musician of all time. They even presented him with a rhodium disc in 1979, considering that his vast sales deserved something better than platinum. Then those clever Guinness people came up with the idea of a Hall of Fame, to include only those whose records were unlikely to be beaten in the foreseeable future. To give an idea of how they rate Mr. McCartney, it's interesting to look at the other five people admitted. Billie Jean King's number of Wimbledon titles will take some matching in the strenuous, all-the-year-round conditions of modern tennis. A great British character, Sir Ranulph Fiennes, crossed both the Arctic and the Antarctic within the shortest overall time as part of his circumnavigation of the globe. Vesna Vulovic, a Yugoslavian lady, was making coffee in the rear section of a plane when it exploded at 33,500 feet: the other passengers were killed, but she survived the fall without a parachute. Colonel Joe Kittinger parachuted from 19.47 miles up in a de-pressurized suit, breaking the sound barrier with his body as a test for the first manned American space flight. Last, but hardly least, comes Vernon Craig, possessor of the inexplicable ability to walk on coals heated to 1,500°F. - that's pretty hot, Centigrade fans - without raising so much as a blister. A BBC programme on 26th May showed the Big Six admitted to the Hall of Fame before an audience of other record breakers. Each had a section of the show to themselves, when they were quizzed by hosts Norris McWhirter and David Frost. The latter asked most of the questions in Paul's closing spot, as you might expect, starting with "Can you remember your first song?" "Yes, it was called 'I Lost My Little Girl', when I was 14-three chords: C, F and G."
Were there any good rhymes?
" 'Her clothes were not expensive/Her hair wouldn't always curl' - that wasn't too good, but I never... used that one much." Was there a moment when you knew you'd made it? "Yes. I'd come back from a club and I was just getting to bed and I heard the milkman whistling 'From Me To You' [whistles]. I thought 'That's it, I've arrived - the milkman's whistling my tune.'" Then Frostie asked Paul about "Yesterday", the most recorded song of all time and one of only three to inspire over 1,000 versions. "It's funny how these songs start... I woke up and I had this tune in my head that I didn't believe I'd written, so I fell out of bed and I found the piano which was next to my bed [hilarity], sat at that and started playing it and I thought 'Well, I like that tune', but I couldn't believe I'd written it. [Paul asked several friends if it was their tune.] After about two weeks, I thought 'Well then, I must've writ it.'" Was "Mull Of Kintyre", the most successful single in Britain before the Band Aid record, one of his favourites? "Oh, 'Mule Of Kintyre', or 'Mulligan's Tyres' ... Originally I wanted to write a Scottish song, realising there weren't any modern Scottish songs - plenty of old, stirring songs... I wondered if I could do it." friend to come up with his bagpipes and he played in the garden, because he said they were pretty powerful things and would blow you away inside." Asked if he knew when he'd written a hit, the intuitive McCartney replied that "You get a funny sort of little feeling, I think... a funny sort of twinge." What did he do with his gold discs, Mr. McWhirter wondered? "In truth, I'd be a bit embarrassed to say 'Come on in, Norris' [indicates imaginary gold discs]. I think it's a little bit too high profile to say 'Good evening, have you seen my etchings and my gold discs?'" Frost again: were there any types of songs he would like to have written? '"English, English, Englishmen/Go out and'-er, it sort of stopped then." Asked if all his songs were hits, Paul remarked on the general feeling that the Beatles or McCartney name made for an automatic hit. "So to try and prove that wrong I wrote a song under another name and I thought I'd got away with it. It was a song called 'Woman' for Peter and Gordon - remember them, eh? - ... quite a nice song and I wrote it under the name of Bernard Webb... But we were doing a concert in Shea Stadium, I looked up and there was this great big banner at the back of the stadium: 'Long live Bernard Webb'. [Laughter.] Rumbled at last!" Paul and Linda thoroughly enjoyed the preceding reception and lingered long at the buffet afterwards, happy to be sndpped in company with the other celebrities. Each member of the Hall of Fame later received a gold medal. 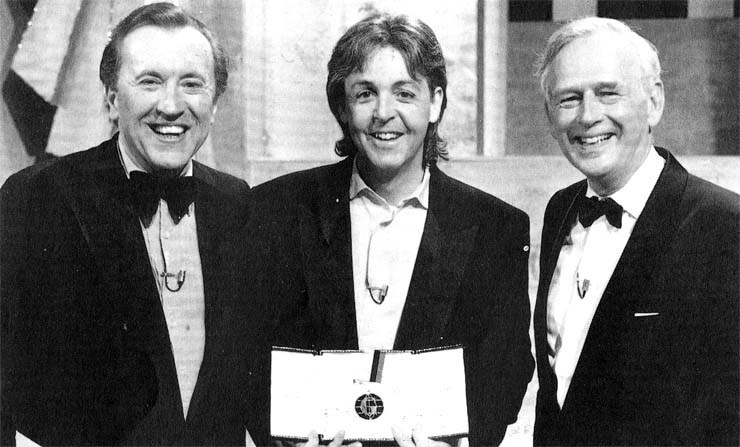 The citation on Paul's reads as follows: "His unparalleled contribution to popular music as a composer and artiste includes 43 one million sellers, 67 gold discs and 'Yesterday', the most recorded song ever written."